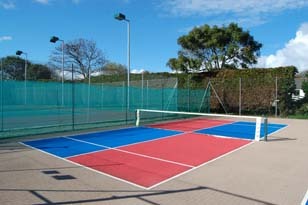 St. Agnes Tennis & Croquet Club is a friendly club situated on the outskirts of St. Agnes, just a few miles from the beautiful north coast of Cornwall. If you are looking to play competitively or just want a social game, we would love you to join us. Please click on the link above for more info. 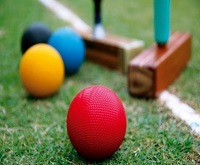 about the Croquet Club. Tuesday, Thursday and Saturday afternoons from 1.30 pm. Monday and Thursday evenings from 6.30 pm. Sunday mornings from 10.00 am. Rusty rackets sessions - Wednesdays 7.00 pm - 8.30 pm. Juniors are welcome to play during these times as well, if courts are available. Juniors have priority on court 4 pm - 6 pm daily. Matches and coaching take place during the evenings throughout the season. Click here to find out more. With the aid of a grant from the Lawn Tennis Association (LTA), and support from Sport England, the club has improved its facilities in the last couple of years. It now has four newly resurfaced hard courts, two of which have floodlights, which allows play throughout the whole year for budding tennis players in the community. The two new mini-courts have proved to be an excellent facility for our strong junior section. 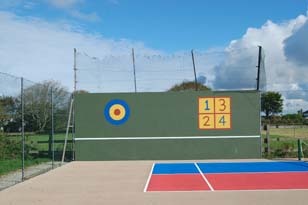 All members are welcome to use the practice wall that has also been constructed. At the end of 2012 the club was successful in its bid to receive funding from Sport England's Inspired Facilities fund. This funding will be used to update clubhouse facilities and work will commence in 2013. Click here to find out more.